Hello dears! I've been obsessing about holographic accessories lately, especially shoes, but it seems like everything I find is long sold out in my size. Luckily, I found a holographic wallet on sale yesterday and ordered it. I figure a wallet is better than shoes anyway, I can use it everyday and not have to worry about it matching my outfit. It'll be the perfect bling to go with my nails too! Speaking of holographic finishes, when I was looking for a red holo I didn't have far to look. 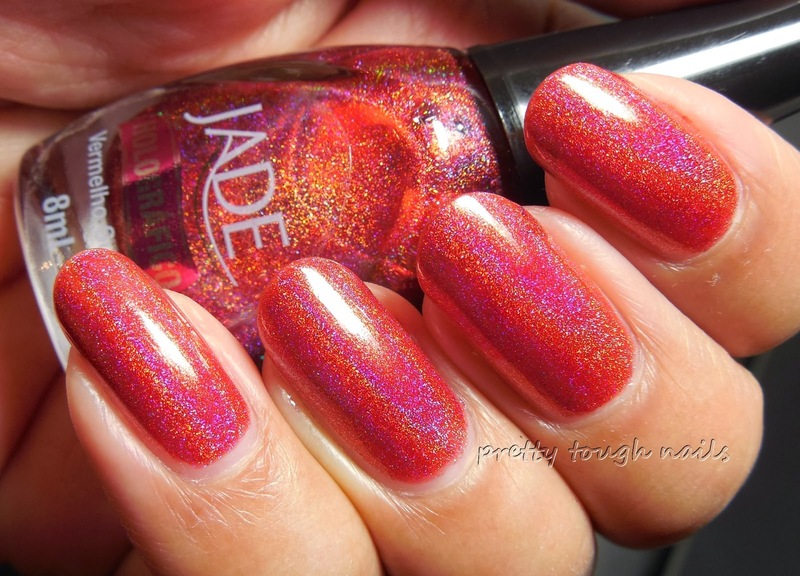 Jade makes the best holos for an amazing low price, and is accessible on most nail e-tailers. I found mine on Color4Nails with reasonable and fast shipping. Vermelho Surreal is an orange based red that leans rust colored in certain lights. 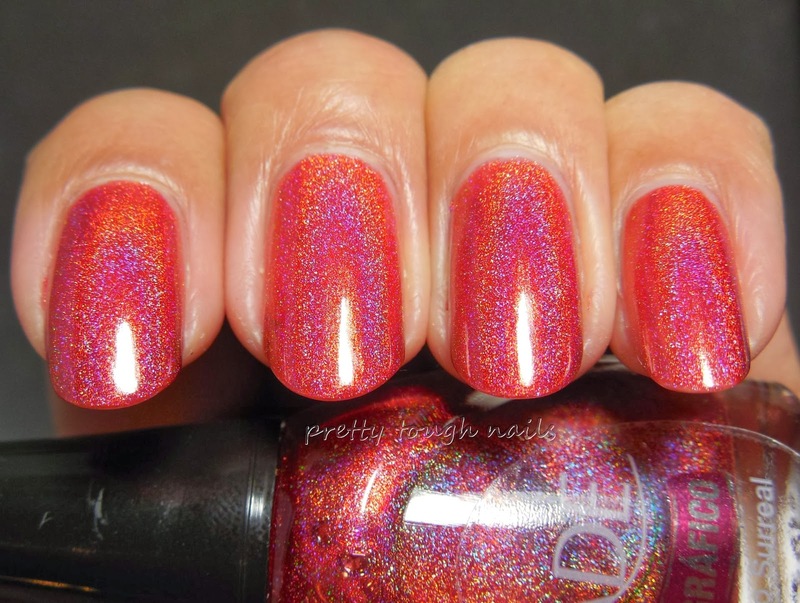 It's not what I would call the perfect red shade, but it's a lovely color with lots of linear holo rainbows. This applied smoothly and easily with a jelly like consistency, and I used three coats for good measure. No topcoat shown here, with the first pic in the light tent, the rest under direct light. 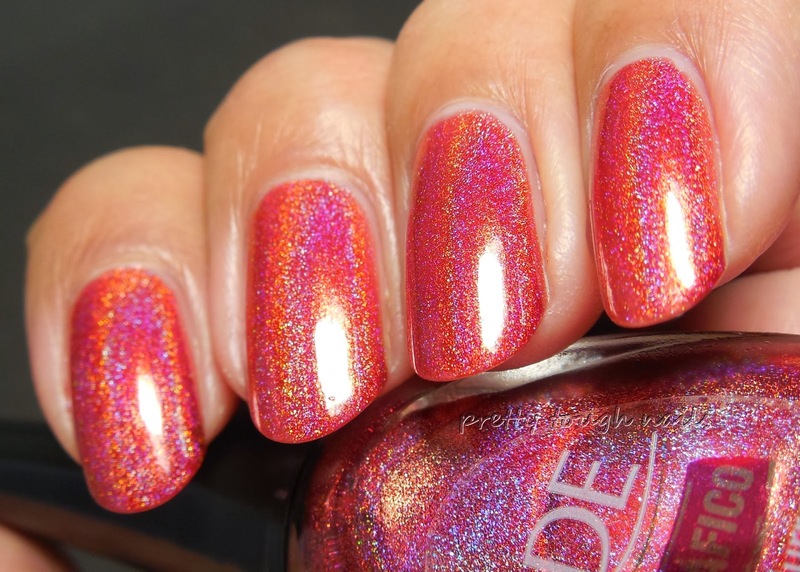 I love holos that have jelly bases because I feel that it really allows the holo particles to shine through. This red reminded me a lot of Enchanted Polish November 2013, but for more than half the price. If you missed out on that elusive shade, you can easily find Vermelho Surreal and consider your search over. IMO, it might even be a better version of red holo because the holo flair is a touch stronger than November 2013. As for myself, I'm now looking for a red holo that's more blue based... any recommendations? Oops, drooled on the keyboard... this is so poignantly beautiful it makes my heart swell up! This is a stunning shade! I normally don't gravitate toward reds but I would totally wear this one.